The environment of modern organizations is so complex and volatile that we take for granted that organizational change is necessary for organizational survival. Yet the literature on organizations has for years described manifold obstacles to such change. First published in 1971, this book extracts from that literature and from experience a comprehensive yet concise overview of those barriers. Because these elements of the analysis are as valid now as when they were originally written, The Limits of Organizational Change is still widely read and cited nearly a quarter-century later. From the premises of this argument, Kaufman drew a number of conclusions about organizational survival and extinction, age and size, centralization and decentralization, and organizational evolution. Subsequent research and reflection induced him to refine and modify some of those inferences. The modifications are spelled out in a new preface that gives fresh relevance to his findings and his conjectures. 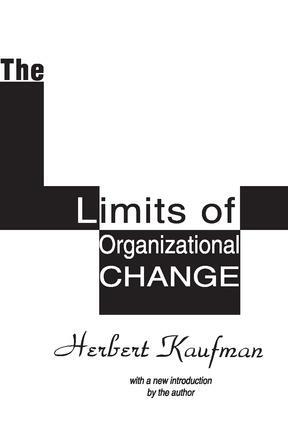 Yet The Limits of Organizational Change is not a ponderous, labored work. As one reviewer remarked, it is "a delightful set of essays . . . a review of empirical research in a witty, conversational style. . . ." (The Rocky Mountain Social Science Journal). It is a book one can enjoy as well as profit from, and will be a useful tool for managers, organizational studies scholars, and sociologists.